Reverberations clang through Alonzo Allen Jr.’s small clay studio at the end of an industrial building in Grover Beach. “It’s a bell,” he says of a reddish-brown ceramic piece he’d just rapped with his knuckles, answering a woman’s question with the sound that defines it. FIND YOUR MAKER: The ARTS Obispo Open Studios Tour includes painters, mosaic-creators, ceramicists, sculptors, wood workers, jewelry makers, photographers, and more. 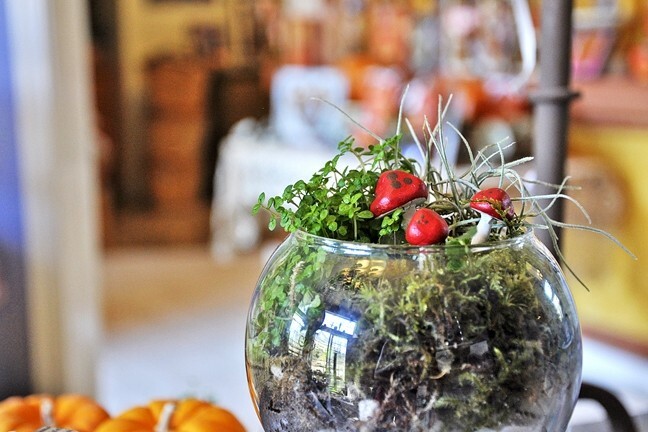 Cindy Dubbers made little clay mushrooms to complete a fairy-like garden in a glass orb. 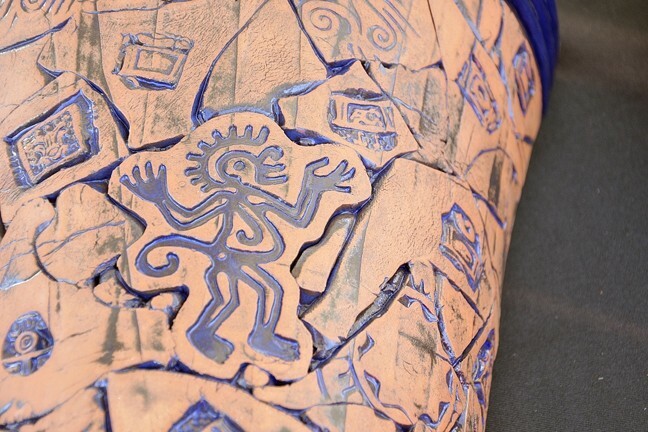 The clay is stamped with patterns stacked above one another and a raised gecko crawls up toward the bell’s neck. The bell’s about a foot-and-a-half tall and is ready for the glazed splotches of color Allen will finish it with. Behind him, an open clay kiln is visible through a doorway, and glazes are stacked in tubs all around him, half-finished pieces stand on a drying rack against one wall, and he sits on a workshop chair in the middle of it all. It’s Saturday, Oct. 8, the first day of the free ARTS Obispo Open Studios Art Tour 2016. Almost 200 artists across SLO County showed off and sold their wares on Oct. 8 and 9, and many will do it again on Oct. 15 and 16, from 10 a.m. to 5 p.m.—welcoming tour explorers into their studios and homes from Nipomo to Paso Robles. Outside Allen’s Siramix—he puts the “sir” in “ceramics, according to his business card—studio door, long tables full of his yellow, blue, and green spotted garden pots, serving dishes, and bowls take in the sun, and several people mill about turning them over for a peek at what they couldn’t see. 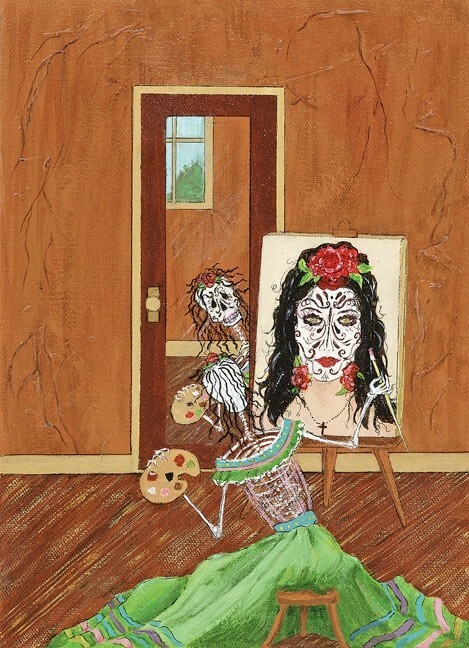 SO VAIN: Anita Moore-Wells’ “muertos” paintings usually involve dancing and music, but in Vanity a skeleton paints a self portrait that doesn’t mimic reality. Those bells range in size and price, from $75 to $500; take about four to six weeks to complete; and Allen can’t keep them on the shelf. They’re built in layers, stacked clay, like all of his pieces—reminiscent of a round puzzle of stamps and figures. He’s been a ceramicist for about 20 years, and five of those years, he’s been stacking out of the Grover Beach studio. Every weekday, Allen spends nine hours at Vandenberg Air Force Base for his day job as a draftsman, before heading to his art studio to clear his head. Ten or 15 people had already signed his guest log by that early Saturday afternoon, a mark of a good open studio tour so far, he said. 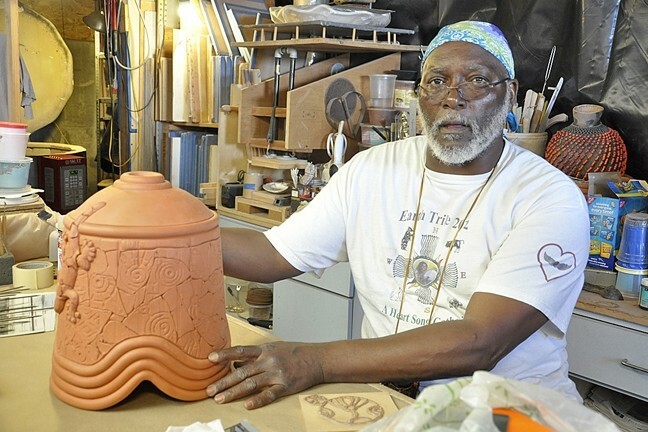 STACK IT UP : Alonzo Allen Jr. talks about how he creates his ceramic pieces, such as this bell that is waiting for spots of color and glaze. Painters Judi Sanders and Anita Moore-Wells welcomed visitors into the makeshift gallery they’d set up in Sanders’ Nipomo garage in Blacklake, her tiny studio connected on one side. Sanders’ extremely detailed, realistic watercolors hung on the right side while Moore-Wells’ folk art hung opposite. 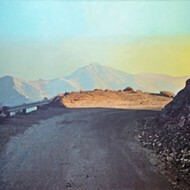 Oct. 8 marks the very first time Moore-Wells has ever shown her work to the public. She’s only been seriously painting for the last two years, although in the past she’s dabbled here and there. She joined the SLO Arts Council, also known as ARTS Obispo, two years ago—and “I had to get my you-know-what in gear,” she says with a smile. Realistic poppies and impressionistic landscapes stare at her collection of “muertos,” which hang on pegboards in the center of the garage. In Vanity, a skeleton paints a self-portrait of herself as a full-figured woman using a mirror that clearly shows her as only bones. 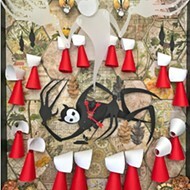 But many of her muertos are mixed-media pieces, with skeletons that dance across old sheet music, bare bones revealed in the backs of red, yellow, and green dresses that twirl across imaginary floors. DIY : The stamps that cover Allen’s pieces are created by tiles which double as tools. He makes them for sale and for work. Moore-Wells is Mexican and Irish, and she’s only been painting the muertos, which are reminiscent of Day of the Dead-style sugar skulls, for the past year. Elsewhere on the Nipomo/Arroyo Grande Mesa, Lynn Schmidt’s photographs are displayed under awnings in her mother’s driveway. And her mother, Patricia’s quilts hang in the garage next to her studio—a rainbow of threads above a sewing machine. 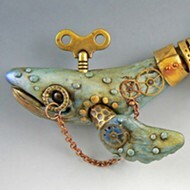 Across the street, Cindy Dubbers’ polymer clay mosaic tiles are only one thing on the art menu. Dubbers’ home has the look of a eclectic store in downtown Arroyo Grande. Hand-wired hanging planters, solar-powered hand-painted light posts, vintage and found items, up-cycled lampshades, as well as hand-made Halloween type things and English toffee are scattered throughout her home and in her front yard. DRIVE A LITTLE: Almost 200 artists from Nipomo to Paso Robles will open their studios and homes to visitors during the ARTS Obispo Open Studios Art Tour 2016 on Oct. 15 and 16 from 10 a.m. to 5 p.m. Visit artsobispo.org to find a catalog and plan your route. “I’ll let you wander around,” she says. 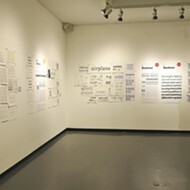 Camillia Lanham is still in awe of the county art scene at clanham@newtimesslo.com.